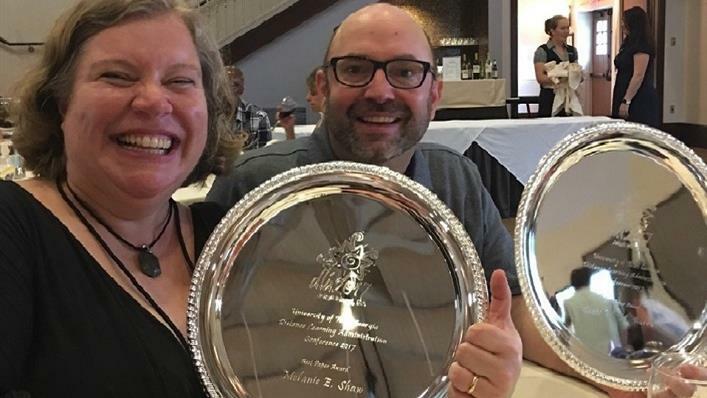 Dr. Melanie Shaw (left) Dr. Scott Burrus (right) and Dr. Meena Clowes (not pictured) from the Center for Learning Analytics Research (CLAR) received an award for Best Paper at the Annual Distance Learning Administrators conference. The paper, "A Comparative Typology of Student and Institutional Expectations of Online Faculty" will be published in an upcoming version of the association's peer-reviewed journal and presented at the July 2017 KWBA symposium in Tempe. A paper written by Scott Burrus, Ph.D., University Research Chair for the Center for Learning Analytics Research, along with co-authors and CLAR fellows Meena Clowes, Ph.D., and Melanie Shaw, Ph.D., was selected to receive a Distance Learning Administration 2017 Best Paper Award. The paper, A Comparative Typology of Student and Institutional Expectations of Online Faculty, will be published in an upcoming edition of the Online Journal of Distance Learning Administration. The team was acknowledged at the DLA 2017 conference opening dinner and award ceremony on Sunday, June 18. Dr. Burrus brings more than 20 years of experience in higher education and social policy research. His current research focus is on the application of learning analytics to facilitate adult learning success in primarily adult learning environments. Drs. Clowes and Shaw are both research fellows within CLAR, and serve as faculty at Northcentral University. The team hopes that this brief study will open a conversation about the differences between institutional requirements and student expectations in terms of faculty engagement and how we, as faculty and administrators, can work together to close any gaps between the two. "The work being done in CLAR is something we can all be very proud of," said SAS Dean of Research and Scholarship Dr. Mark McCaslin. The Distance Learning Administration Conference is sponsored by the Online Journal of Distance Learning Administration and The University of West Georgia.